Reviewed by Ray Simmons for Readers’ Favorite, even though I have read and enjoyed the book myself. Ray nails it. 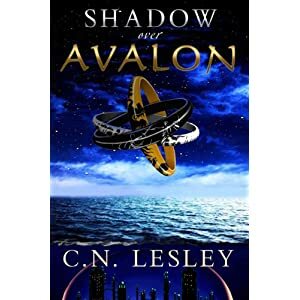 Shadow over Avalon by C.N. Lesley is a well written and original retelling of the Arthurian legend. This book brings freshness to the well-known and often told story by placing it in the far future. The King Arthur story has a multitude of fans and some of us will buy any version of the story we come across. It is a great surprise and reward when a writer I am not familiar with gives me an exciting and totally new version of the story. C.N. Lesley’s story has many of the familiar characters we have grown to know and love. Characters like Merlin, Uther, and Arthur himself are in this book and easily recognized, but because the writer has created a well thought out and interesting future world with a complex and dynamic culture and society, everything about the characters and story is new and exciting. In medieval England a lot of conflict revolved around heirs and ancestors and this book opens with Arthur determined to find his parentage, while at the same time refusing to donate his own DNA for some purpose he is not completely sure of. I enjoyed Shadow over Avalon immensely. In my opinion C.N. Lesley balances all aspects of the novel perfectly. The characters are complex and well developed. The same can be said of the world they inhabit. There is conflict and relationship tension throughout the story to such an extent that I couldn’t wait to turn the page to see what would happen next. I also love Arthurian stories. Thanks for the recommendation, Christoph! My pleasure. All the Best! I certainly agree with the reviewer. Excellent book! I too enjoyed it tremendously! Absolutely on my TBR list as I loved her other book. You’re correct Christoph the reviewer definitely nailed the whole aspect of Shadow Over Avalon. C.N Lesley knows how to keep the interest of the reader.